Brain: Specific brain tumors such as meningiomas and pseudotumor cerebri. Heart: Coronary heart disease and hypertension. Liver: Non-alcoholic fatty liver disease which may lead to cirrhosis. Gynecology/Oncology: Women are at an increased risk of developing breast and uterine cancer. Urological: Urinary stress incontinence, impotence. Bariatric or weight-loss surgery not only helps prevent and treat these conditions, it can also potentially eliminate them, allowing a person to lead a longer, more productive and healthy life. Bariatric surgery should be considered for anyone whose body mass index is 35 and above with comorbid conditions such as diabetes, hypertension, sleep apnea, etc. Anyone with a BMI of 40 and above should also consider this option, even if they do not have any other complications. Surgical weight loss has been shown to be far more superior to conventional weight loss methods, such as diet, exercise and medical supervision, in decreasing the incidence of diabetes, heart attack, stroke and cancer. Most people who struggle with obesity have attempted to lose weight through a regimented diet and exercise programs. And initially, many of them may be very successful in losing a lot of weight. Unfortunately, almost all of them regain all the weight back in a period of weeks to months. Bariatric surgery is superior to conventional weight loss methods in that not only there is a far more significant weight loss, the surgery also helps prevent the patient from regaining that lost weight. That is not to say that people have not regained weight after bariatric surgery. In fact, there is a little weight recidivism, particularly a year after surgery. However, the amount of weight gain typically stays around 10 to 20 percent of excess body weight after the patient has lost 60 to 80 percent of excess body weight. Currently, there are two types of bariatric surgery options: gastric bypass and sleeve gastrectomy. Both operations are typically done via a laparoscopic approach. Gastric bypass is both a restrictive and a malabsorptive type of operation. Portioning a section of the stomach into a small pouch, and then connecting that pouch to a small intestine reduces the volume of the stomach and restricts the amount of food a person can take in. Mild malabsorption of calories and nutrients is created by “bypassing” the biochemical digestion of food, resulting in the much-needed deficit of calories. Sleeve gastrectomy is a hormonal and a mostly restrictive operation. This procedure involves transecting the stomach in manner that re-shapes the stomach into a narrow tube similar to a diameter of an intestine. Two-thirds of the stomach is eliminated from the body and with it the hormonal imbalance that causes the obese patient to always feel hungry. Both gastric bypass and sleeve gastrectomy may result in similar complications such as post-operative hemorrhage, infection, and disruption of stomach connection with leak. The ultimate decision on which surgical option is the best for you should be made by yourself, your doctor, the surgeon, and the clinical team handling your care. — Dr. Avulov specializes in general and bariatric surgery. He received his doctor of osteopathic medicine from New York College of Osteopathic Medicine in Old Westbury. His did his surgery residency at the Peninsula Hospital Center in Rockaway and Flushing Hospital Medical Center in New York. In 2014, he completed a fellowship in advanced laparoscopic surgery at the Lahey Clinic of Tufts University School of Medicine in Massachusetts. 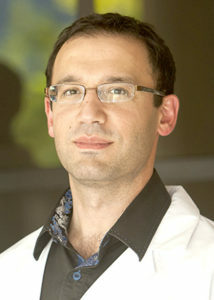 Dr. Avulov has done research on bariatric surgery outcomes and performs gastric bypass and gastric sleeve. I had no idea obesity had so many other health implications. This definitely causes me to consider bariatric surgery more seriously.